Garden with kitchenette - Located across the road from the beach (approx. 1 1/2 minutes walk to the beach). Each unit contains a full bathroom, and the kitchenette has a two burner gas range. Garden without kitchenette - Located across the road from the beach (approx. 1 1/2 minutes walk to beach), and each unit contains a full bathroom. Beach side - Located on the beach side of the road, these rooms are slightly smaller than the Garden rooms, and the bathroom contains a shower without tub.  Rates include 12.5% Government Tax. 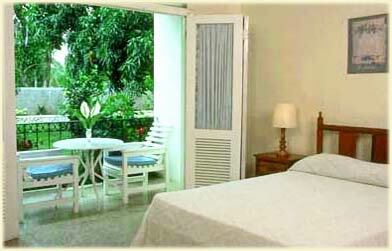  The rates are quoted on a 1-8 person occupancy.  Max occupancy 4 people,but three is suggested.  Extra person charge is $20 per night. Rejuvenated by the sea and sand, you long for exercise. Water ski, windsurf, snorkel or scuba dive anytime you like.